"Elive has entered the parade......."
"The Elvises made it back to Oak Cliff's Mardi Gras Parade this year." "Third place went to the World Famous Wheelie-ing Elvi, which I could try to explain, but it’s easier to just give you a link." They were among 58 entries in the fifth-annual parade Sunday afternoon along Davis Street to Bishop Arts.. Runner-up was the ever-edgy entry from the Tradewinds Social Aid and Pleasure Club, followed by the ever-buzzing Elvi on wheels. 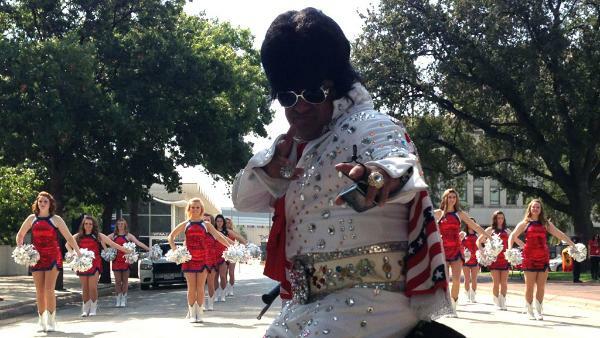 Men dressed as Elvis, ride in a circle doing wheelies on mini-motorcycles on the parade route. "About a dozen Elvises stole the show with their mini bike tricks." The seventh annual parade begins at 2:30 p.m. with approximately 50 entries, including the marching bands from Mansfield High and Summit High, floats and Cub Scouts. Pre-parade entertainment starts at 1:30 p.m., provided by the Mansfield Fire Clowns and The World Famous Wheelie-ing Elvi. Mansfield: Santa is Coming To Town. "MystiQal - Mardi Gras Parade in Dallas"